“When I went to California in 2001, I was convinced that I would discover some new form of urbanity, but I found the desert instead”, says Heike Baranowsky as she leads us through the exhibition Time traps in Lentos Linz on the morning of the official opening. The German artist reflects a pleasant, down-to-earth nonchalance which also happens to be one of the most striking characteristic of her artworks, notably videos. In her art, Heike Baranowsky is examining the possibilities of digital takes, swiftly switching from stills to moving images and vice versa, making it difficult to tell when the manipulation starts or ends. By using the static shot and the long take, she is creating barely noticeable alterations of initial frame, playing with the notion of space and time. Some of her videos have a touch of documentary, but only for a fragment of time before drifting to the other spheres of cinematic arts. That is also the case in her latest work Barometer (2012/13) filmed in the premises of the former training centre Kienbaum (ex East Germany) near Berlin, a place specially built to train professional athletes and equipped with air pressure system which still can generate conditions similar to those prevailing in the mountains. The sport teams would train under the constant change of air pressure, in this way increasing their breathing capacities and the regeneration of red blood cells. Although the training complex was out of use for the past thirty years, the inner space looks exactly the same as it did at its most active days. Still, the artist wasn’t allowed, out of security reasons, to move freely in the building during the filming of her project and she had to opt for a compromise – positioning her cameras on the exactly same spot where surveillance cameras were already mounted. 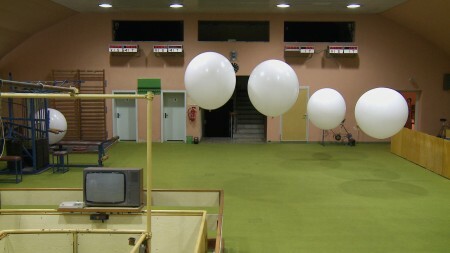 In order to illustrate the invisible change of air conditions in the room, Baranowsky used the weather balloons, leaving them to perform to their own choreography, trapped in a mechanically controlled environment. The camera tracks, in a documentary pace, the ghastly motion of stationary bicycle pedals turning at their own accord (which the artist would manually set in motion and then film every individual movement) in a room totally deprived of human presence. Step by step, take by take, the rest of the room with its training facilities is revealed, and slowly, its spooky claustrophobic space becomes alive with movement of antiquate machines. The artist is setting the so called inanimate objects into motion, opening the question about the extent of scientific knowledge on the nature of certain phenomena such as “sailing stones” in California’s Death Valley, a topic which she took in her video Racetrack (2010). The sailing rocks, stones of all sizes scattered across the Death Valley’s Racetrack Playa Plateu, have been confusing scientists for a very long time because of their apparent ability of moving on their own. Heike Baranowsky’s three-chanel installation whose title refers to the slow movement of the stones was created by means of stop frame animation. It’s an art-piece out of thousand tiny puzzle pieces with every image generated separately by different positions of the camera circulating around the stone. The viewer has the impression of seeing the stones moving and by doing so, leaving a deep trace in the desert sand of the dried lake bed. 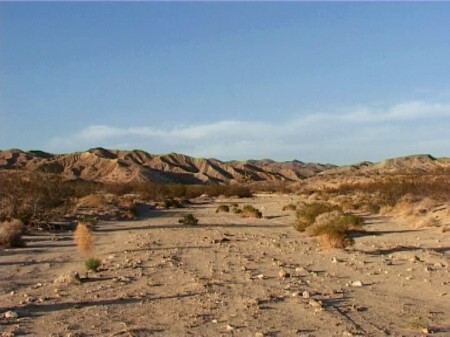 The Californian desert was a place where two of the videos shown at the Lentos were created. Apart from the above-mentioned piece, the museum visitors have a chance to see Heike Baranowsky’s one-chanel installation Blown in the Wind (2002) which follows the movement of tumbleweeds through a desolate barren landscape. Trailing after the desert plant, the artist freezes every other movement – even the sand grains stay where they are.